← What Losses Are Happening In Your World? “My grief bubbles up at the most random times,” she says as we find ourselves talking about our losses during our coincidental meeting in the YMCA locker room. Dad loved coming over for pancakes on Saturday mornings, eating a simple breakfast with us before watching cartoons with his grandchildren. The last time we were together he ate this same Saturday breakfast at our home, and two days later he was gone. In the last few weeks I have attended two funerals, given a grief presentation for widowers and widows and spoke with people of all ages about life losses they are experiencing. Like all in the caring professions, I forget to care for myself – shouldering the weight of journeying with others through loss. 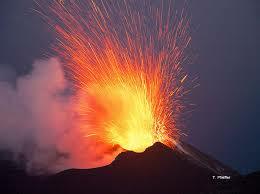 Like the hot molten lava that spews out of a volcano, grief needs to be released. Today my tears bring relief, other times the release comes through exercise, pounding a pillow, or finding respite in nature. Whether our loss is recent or many years in the past, we can find our emotions fragile. Let it out. Find healthy ways to release the pressure of your loss and allow your grief to bubble up! This entry was posted in Grief, grieving, Healing, Lessons from others, Life's Losses, My story and tagged emotions, funerals, grief, grief work, Loss, tears, volcano, widowers, widows. Bookmark the permalink. 7 Responses to What Makes Your Grief Bubble Up? I was sitting at the dining room table the other night going through my blog posts looking for a few titles I could use for an exercise in coming up with “chapters in my book of life”. I came across one in November of 2013 when I had to put my beautiful Loki Boy cat down (18 years old). He had been through so much of my spiritual quests with me. He was a lover too, not a fighter. It was one of the most difficult things I’ve ever had to do — to let him go. So as I was reading through my blog, I started to sob, and then it was a wail. It was a beautiful release. I also have had times of tears remembering my mom or my dad doing or saying certain things. The connection is still there through spirit. Thank you Kath. Letting grief “bubble up” is much healthier than trying to “keep a lid on it.” When it’s released bubble by bubble, it’s much easier to cope with the spillage than when time and pressure build it to the point of popping over triggers of all type. So true and it is much healthier for our bodies also! Thanks for your important insight! What a beautiful, sweet memory you have of your Dad enjoying family time with you and your kids. Yes, memories are the ultimate healing balm!